Regular readers of Stripper's Guide know that there is a long history of comic strip and cartoon panel features that were specifically designed to be run on classified ad pages.Here's a few we have covered in the past: Classified Ad-Ventures, The Little Old Wise Man,Want Ad Willy. The idea of the features was not just to entertain, but also to point out the virtues of classified advertising, thus stimulating ad sales. 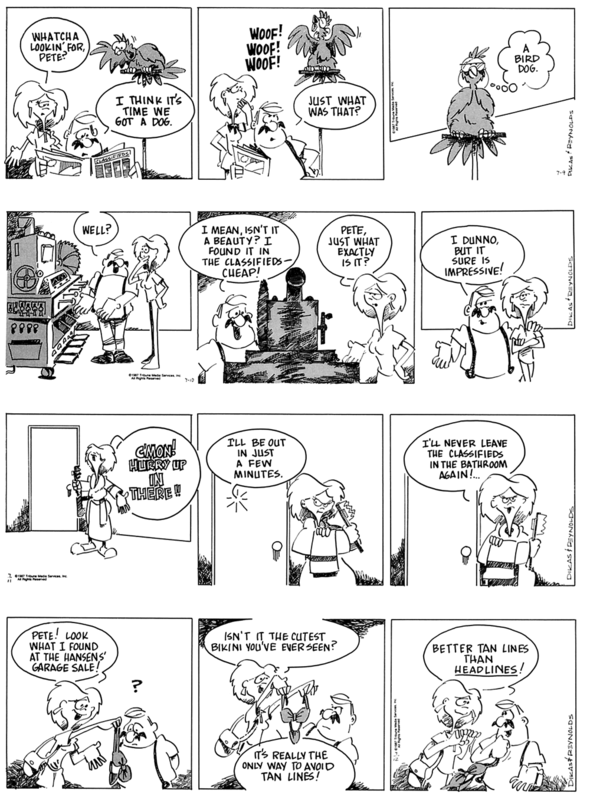 For some reason, starting around the 1970s I'd estimate, these 'classified strips' seem to have fallen out of favor. Maybe newspapers felt that the marketing wasn't paying off, but if that was the case you'd think they would have figured it out a little faster than over the span of fifty or sixty years that these features were around. Today we're taking a look at what may well be the last 'classified strip' ever offered by a major (or maybe even minor) syndicate. 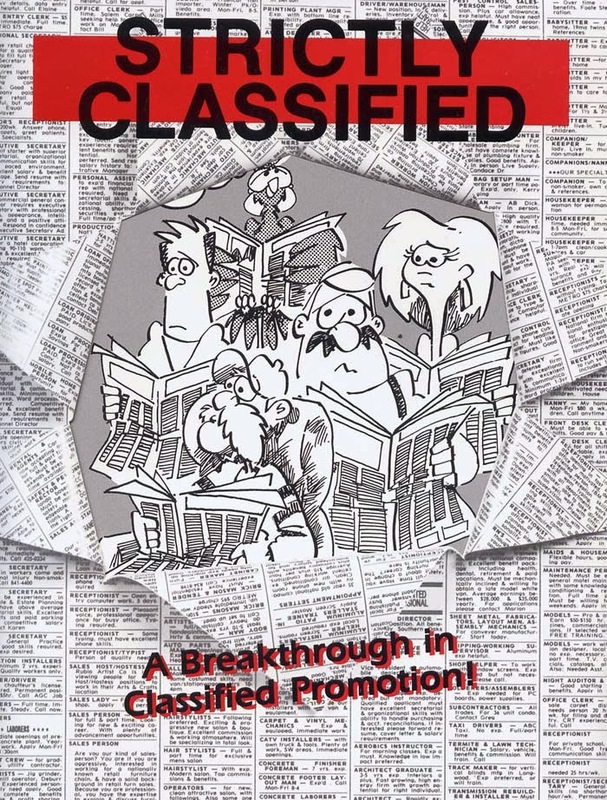 Debuting in 1987 through Tribune Media Services, Strictly Classified was by the team of Paul Reynolds (art and writing assist) and Mike Dikas (writing). These two were a real dynamic team -- they not only wanted to produce a daily strip for classified sections, but also offer a steady supply of spot art that could be sprinkled amid the ads to break up the monotony. It seems like a really attractive package deal, but it just never caught on. Despite claimed sales to 175 newspapers, and an NCS award nomination in 1989, the feature was running so far below the radar that it wasn't even listed in Editor & Publisher's annual directory after 1988. 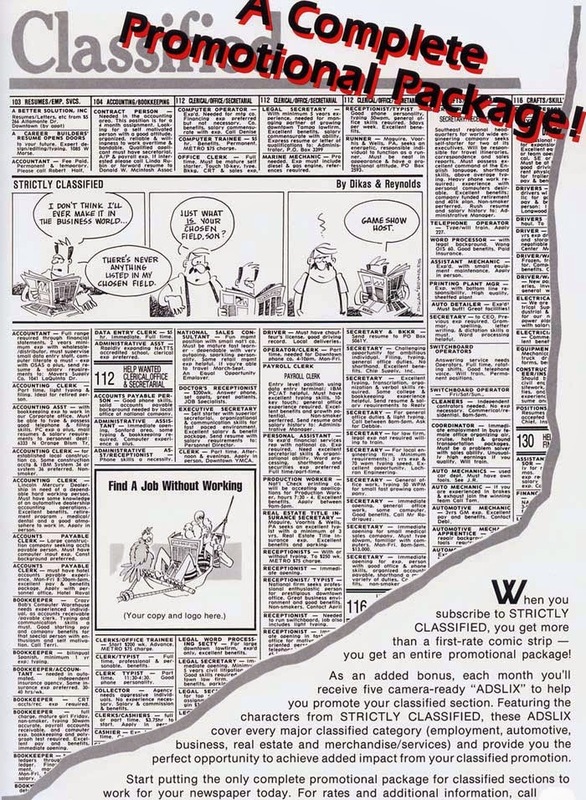 According to co-creator Paul Reynolds, the reaction of newspaper classified editors was rather bizarre -- they generally regarded the strip as a loss of ad space revenue, ignoring the marketing potential entirely. With that kind of half-witted thinking, it wasn't long before Strictly Classified was demoted to a part of the Tribune weekly service, and then dropped altogether around 1995. 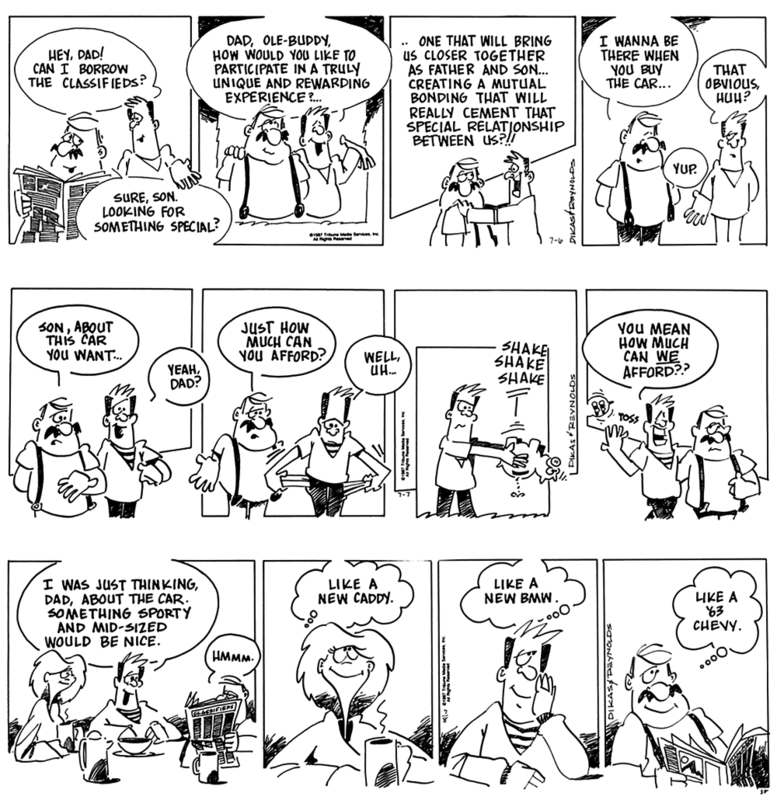 Dikas and Reynolds considered resurrecting the strip as a self-syndicated feature, but they quickly found that they got about the same reactions as the syndicate salespeople had -- why would I want to 'waste' space in my classified section? Thanks very much to Paul Reynolds, who was nice enough to answer questions about the strip, and even supplied the samples and promo kit images seen above. Thanks Paul! Do you have any info. on an attempted Skippy revival in the early 70's? What little I know is in my book. Thanks for the beautiful write up! -I can sleep well tonight knowing Our efforts have not been in vain and we have 'made our mark' in the anals (my co-author corrected me as he did when we were creating together- spelling not my forte) - uh-hum - "annals" of classified history!! Cheers and many Mahalos!